I’ve worked with Alan d for many years. Not only do they train my apprentices but very often I put new team members through one of their private weekly refresher courses when I feel that they have potential but are not of the standards that my 2 salons require, particularly if they haven’t done their initial training with Alan d.
Recently though, as it became more difficult to recruit school-leavers I was approached by a local provider. Not only were they based closer to my businesses, but they had the right students ready to join us. This was very attractive. No hassle or expense trying to recruit. No persuading parents that their treasured off-spring need travel into the City and no expensive rail fares. They could even do day-release so I had them for the rest of the week. In fact, for a while it was good, very good. It was early this year that in conversation with one of these apprentices I found out that she was about to qualify. A year after she had started her NVQ Level 2. She was very excited and clearly proud. A test was hastily set up so that I could ensure that she was ready for the early stages of salon life; some basic haircuts, blowdries etc. Unfortunately she couldn’t actually cut hair and truthfully she struggled to hold a blowdrier. And then the realisation dawned on me and the Team. Her online portfolio was filled out, her assessments completed and we’d been sold a dream! This wasn’t the standard of training I’d been used to. This was about the numbers. Get them in, get them signed off and get them out. In the past Alan d were in regular contact with us. We had in-depth reports sent back with the student each week. If we had a concern about a level of confidence or skill, the Alan d team would give the student more time. 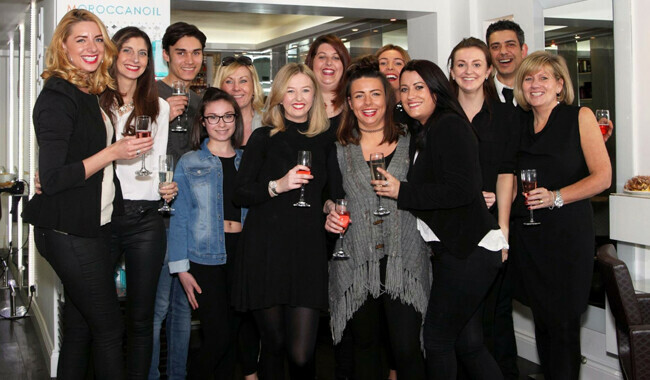 Their unique weekly-block training programme really inspired confidence in the apprentices and coming back to the salon on the Saturday after their week of training, they were inspired. I’d gone for the easy option and now faced a serious problem of how to retrain this young lady. Sadly, it wasn’t only her. The good news is that Alan and Edward sympathised. They agreed it was a royal pain to find the right candidate, but we all agreed that when you do, they deserve the best training as they are the future of any business. So, Tikadi are back! We have 3 students at Alan d taking both NVQ levels 2 & 3 and looking at my business I counted 6 ex-Alan d Students who are now on the floor and integral to my success. Don’t kid yourself, it’s not easy, but it’s definitely worth it.